Amazon.com description: Product Description: The primary ineluctable facts of the birth and death of each one of the constituent members in a social group determine the necessity of education. On one hand, there is the contrast between the immaturity of the new-born members of the group - its future sole representatives - and the maturity of the adult members who possess the knowledge and customs of the group. On the other hand, there is the necessity that these immature members be not merely physically preserved in adequate numbers, but that they be initiated into the interests, purposes, information, skill, and practices of the mature members: otherwise the group will cease its characteristic life. Even in a savage tribe, the achievements of adults are far beyond what the immature members would be capable of if left to themselves. With the growth of civilization, the gap between the original capacities of the immature and the standards and customs of the elders increases. Mere physical growing up, mere mastery of the bare necessities of subsistence will not suffice to reproduce the life of the group. Deliberate effort and the taking of thoughtful pains are required. Beings who are born not only unaware of, but quite indifferent to, the aims and habits of the social group have to be rendered cognizant of them and actively interested. Education, and education alone, spans the gap. 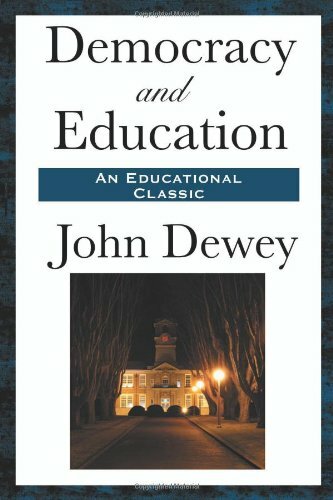 John Dewey was an American philosopher, psychologist, and educational reformer, whose thoughts and ideas have been greatly influential in the United States and around the world. He is recognized as one of the founders of the philosophical school of Pragmatism. He was a leading representative of the progressive movement in U.S. schooling during the first half of the 20th century.